Last weekend, I went to a friend’s house for a ritual burning. Don’t worry – no humans or animals were harmed. Both of us were in the process of clearing the backlog of documents and paperwork that had been cluttering filing cabinets and cupboard for far too long. Among the archived bills and receipts were more personal papers, and we spoke about these as we let them go. My friend consigned her Year 12 assignments – dating from 1976 – to the flames. Sheet after sheet of beautiful, neat handwriting, diligently researched essays about ancient Greek battles and the poetry of Keats and art and architecture of the middle ages, turned satisfyingly to ashes. And I got rid of diaries and journal pages. What a lot of whingeing! Heartbreak, heartache, boredom, discontent, stress and pain. How useful those pages were at the time, a pressure valve and outlet. But no need for them now; those were old hurts and worries and time to move on to new ones. Why had we kept these things for so long? My friend said that it was the feeling that she’d put so much effort and time into those essays, so they couldn’t just be trashed. And as for me – perhaps there was some idea that by documenting your life, you prove that you exist. Or – in the case of the reports and references – simply some vague feeling of obligation to authority. Who knows? I certainly don’t. I only know that I loved watching these things curl and singe and brown and then blacken, flare up and flame and eventually turn to grey ash. What a feeling of freedom and lightness. This weekend, I’ve gone through my bookcases and had a mighty purge. 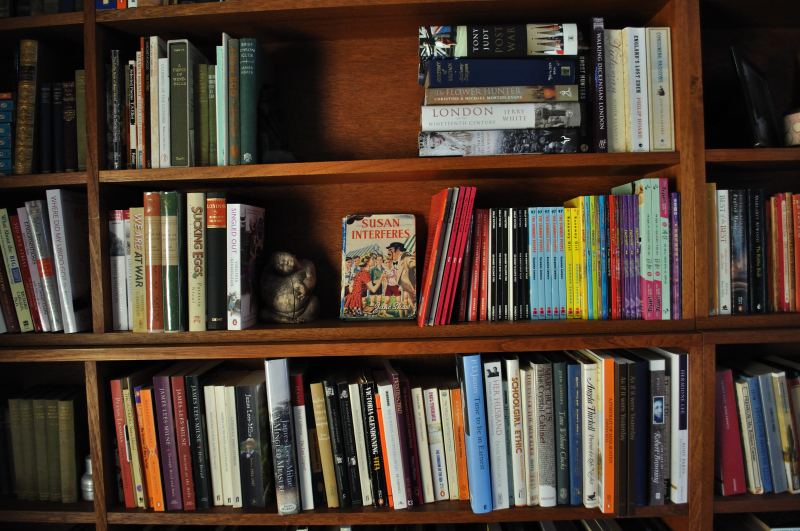 Some books are going to the Op Shop, some to the bin, and some to the local antiquarian and second-hand bookseller. I know some people can’t throw books away, but there are things I’ll never read again, interests that have waned, projects that have been long completed. I don’t need the evidence. And emptier shelves means room for more books.